A Snow Groomer doing his thing carving out a great product for us to ski and ride. Click to Enlarge! In the 70’s (yes, I am up there in age) one of my favorite albums, was They Only Come Out At Night, by the Edgar Winter Group. The biggest song off the album was an instrumental, Frankenstein. The other day I was listening to 70’s on 7 on SirusXM and heard Frankenstein and it got me to thinking about what is ahead for most ski resorts in the southeast the next week or so. By the grace of Mother Nature, most, if not all resorts in the region are having a pretty good President’s Weekend, with nice visitation and conditions. I have already mentioned that all of the resorts were looking ahead during the most recent cold spell and stockpiled snow just about everywhere and some of that snow came in handy over the last few days, to make sure the holiday crowds had plenty of slope coverage. Now, back to that night time thing. You see I truly believe that most folks headed to their favorite resort only look at daytime temperatures when checking out the weather forecasts. I am here to say, that isn’t the most critical time to look at when checking out those weather conditions. When the lights go out and the skiers and snowboarders leave the slopes and the resort, that’s the most important time for mountain ops. That’s when the groomers head out on the slopes to make things nice again for all of the skiers and snowboarders the next day. So you say, but they are not making snow, everything is going to be bad, right. Well no not exactly. 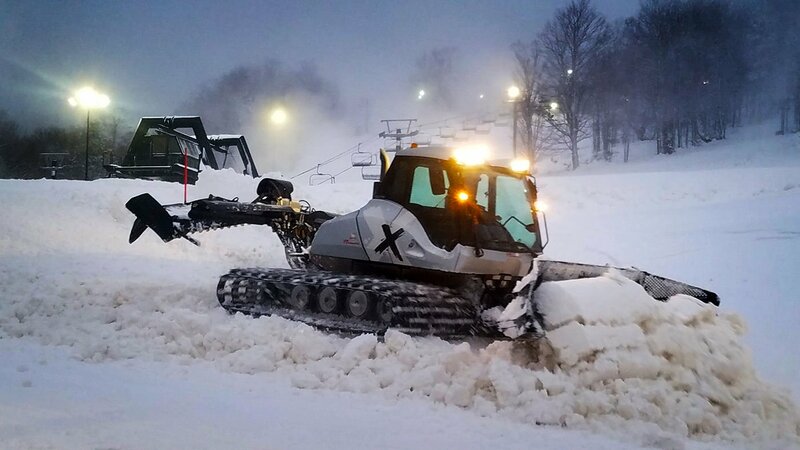 You see as long as the temperatures are in the low 40’s to the mid-30’s, the groomers can get out there and do some magic, getting the slopes ready for the next day. I mean you really don’t think all of those nice lines that you see on Facebook pictures, just happen. Many times, those groomers head out on the trails right after all of the skiing and snowboarding is completed to just push the snow around and flatten things out for all of the carving to occur the next day. After the first wave of groomers are done with their pushing assignments, the snow is allowed to set up and harden on the surface. That’s when the second wave of groomers takes over, many times occurring around 4 or 5 am, depending on how much terrain is open at that time. That’s when all of those fancy lines start appearing on your favorite trails. The next week or so at all of the resorts in the region are looking at some challenging temperatures to be honest with you. Looking at the advanced weather forecast, I really don’t think you can call it one of those thaws that we just don’t like. But none the less, we are going to see some mild temperatures that will probably keep the snowmakers in the barn for awhile and let their brother groomers shine, in order to keep every skier and snowboarder out there happy. There are probably going to be some trails that go ungroomed, for the most part that will be limited to expert slopes and that will make bump lovers quite happy. Looking at those temperatures, those bumps are probably going to be of the soft variety, so if you are looking to learn to do some bump skiing and snowboarding this is going to be a time to test your knees out a little bit. But for the most part, those creatures of the night, will be taking care of the greens and blues, making sure the majority of skiers and snowboarders will be able to enjoy their time on the slopes. Jumping back to all of those stockpiles of snow that were made a couple of weeks ago. They are probably going to be going bye-bye the next week or so, in order that there is adequate coverage on the slopes. There are also probably going to be nights when the groomers are only going to make it out on the flats and help pile snow around the lift’s ramps. That brings me to my science lesson of the week. The best way to lose snow on any trail is to move it during mild temperatures. For the most part, since there is more water in manmade snow, that type of snow can withstand the upcoming mild temperatures a bit more than what Mother Nature provides us from the skies. 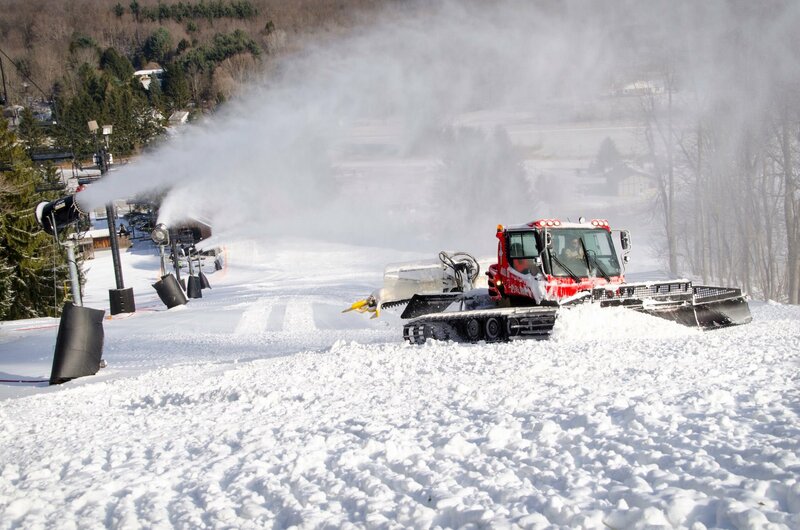 But by moving snow, either through grooming or even skiing and snowboarding, that puts air between the manmade flakes, thereby allowing melt to occur quicker. But if you don’t move the snow, at least by grooming, the snow will last longer for everyone to enjoy. So when you are making plans for upcoming trips I really advise not only to look at those daytime temperatures, so that you know what to wear while skiing or snowboarding, but also to take a glance at those all important overnight temperatures, that will allow those creatures of the night (groomers) to get out on the slopes. Also, don’t forget to check those webcams to see what the conditions look like at your favorite resort in the region. I can not stress this is a lot better than guessing on what the conditions are going to be when you arrive and you say, “I wish I would’ve known before we left.” You can then just think, I should’ve done what Joe told us and checked things out before setting sail. Or you will get there just in time to see the creatures of the night finishing up their business and it will be time to have some fun. That’s it for this week, of course, there’s more to come as the season continues. Just remember whether it be cold or whether it be hot, we’ll weather the weather, whatever the weather will be. Think about it! See you on the slopes. Joe is well known around the southeastern ski circles. Stevens was Director of Communications at Snowshoe Mountain Resort for 16 seasons with another 15 years prior to that in Richmond, Virginia newsrooms. 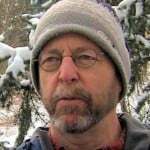 Joe serves on numerous boards and committees and currently is a spokesperson for the West Virginia ski areas.Joe has been a featured columnist on SkiSoutheast since 2005 and has written numerous articles for us, as well as for others promoting all of the southeastern ski resorts. Joe resides in Charleston, West Virginia, with his wife, Angie, and son, Christian. He is an avid snowboarder and marathon runner.